On Tuesday evening, Illinois Rep. Tammy Duckworth won election to the Senate, in what became one of the most talked-about congressional races of the 2016 election. Duckworth's win was important for both Democrats and women in the Senate, but it also sent a strong message to those who found themselves against her in the course of the campaign. To borrow a phrase from elsewhere in the election, Duckworth's win trumped hate. Duckworth's race against Republican incumbent Sen. Mark Kirk was called early, with local media tweeting their projections as early as 5 p.m. EST. Her opponent failed to win reelection to what would have been his second term as a senator. Meanwhile, Duckworth's win helped Democrats as they sought to win back control of the Senate. It wasn't clear at the time that Duckworth's race was called if Democrats would win the net number of seats they needed, but her win was one of the most-anticipated opportunities for the party to make up some ground. Not to mention, Duckworth's win will add another woman to the Senate floor, which it could desperately use. Although women make up more than 50 percent of the U.S. population, they make up just 20 percent of the current U.S. Senate. In a way, Duckworth's win was also a victory for the anti-Donald Trump movement. 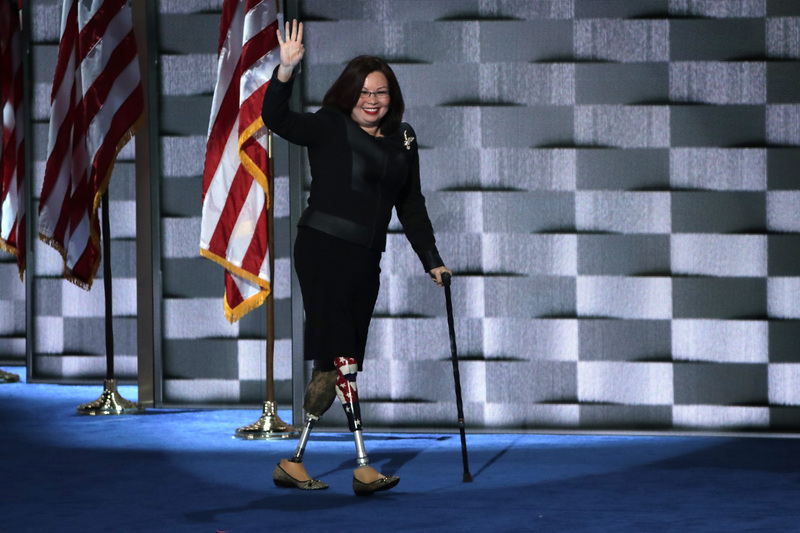 During her campaign, Duckworth, an Army veteran and the first female double-amputee from the Iraq War, criticized Trump for his comments about military service. In particular, she took issue with his comments about the Purple Heart. In August, Trump said, "I always wanted to get the Purple Heart. This was much easier," after being gifted a Purple Heart medal from a veteran. Duckworth has a Purple Heart of her own. It's an honor bestowed upon those who have been injured or killed in action. Her message to Trump after his comments was a poignant reminder of the pain that service members must go through to earn that honor. Duckworth faced similarly inappropriate comments in her own race. Kirk, her opponent and the race's incumbent, challenged Duckworth's commitment to the country and her military service. When Duckworth stated that her family had served in the U.S. military since the days of the American Revolution, Kirk said in a debate, "I had forgotten that your parents came all the way from Thailand to support George Washington." In fact, Duckworth's family does have a long history of service to the country. According to The Chicago Tribune, Duckworth's mother is of Chinese descent and her father is a veteran of the U.S. military. From her own race to the larger political discourse, Duckworth overcame the hate to win a hard-fought seat in the U.S. Senate.